Jock Horror is Nirvana’s twist on the family of strains that arose around the Jack Herer name. 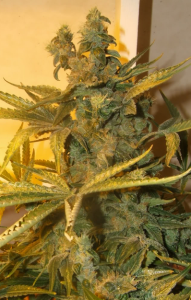 The mother is a Haze 19 x Skunk, a hazey hybrid cross of Holland and California strains. Jock’s father is an old-school Northern Lights, a mostly indica plant taken from a 20-year stable Afghan x Skunk #1 cross whose line was preserved in the marijuana mecca of America’s Pacific northwest. This strain plays with a composition familiar to the Jack strains that began when Sensi’s multi-haze-skunk cross adopted the name of the legendary hemp activist. However, Jock Horror is its own original strain derived from the breeding work and the genetics collection of the Nirvana team. In this interpretation, Nirvana combines a sativa haze, hybrid Skunk, and indica Northern Lights in a three-way cross that is mostly sativa. Jock Horror is a stable strain that has become a classic offering from Nirvana since it was first introduced in the mid-1980s and remains a tried-and-true favorite among Nirvana’s breeding team. The Jock Horror plant forms a traditional pine tree with medium-thin leaves and dense buds that cascade into extended calyxes, arching in a long cylinder of goodness. Nirvana recommends growing Jock Horror in soil with organics for the best flavors. Sea of green setups are good for Jack Horror because it does not branch very much, and the branches it does form are long. Jock really likes conditions to be reliable in the grow room., but is not as difficult as other connoisseur sativas, and not as bland as more commercial strains. This strain really smells up the garden, gaining two-thirds of its total height during flowering. Outdoors, this variety finishes at the end of October. it can reach monstrous heights of 9-10 feet (3 meters). Jock buds at finish are frosty and tight. The calyxes often form horm-shaped ends as they pile on the tips of the colas. This strain may be a jock, bout on finish the smell is fresh and inviting. The taste is floral with a tangy sweet-sour haze edge. Jock Horror offers a classic sativa high, powerful and visual with a nice endurance. It is a good strain for going out dancing, enjoying time with friends, or just making something dull more tolerable and possibly entertaining. Ever smoke or grow Jock Horror? Tell us about it in a comment below!